The Foundation in Light is a unique course in the spiritual understanding and working knowledge necessary to nurture and develop a life in healing – whether for yourself and those around you, or to take a healing path into a career as a therapist. This course provides all the building blocks for a Foundation to reach into, and towards, all your potentials. Many students have found the course to be truly life changing. The course is over 12 months and there will be a Certificate of Completion which assists entry on all The Light of Hope CIC College of Light Diploma courses. The ‘Foundation’ course is experiential and aims to develop good spiritual ‘housekeeping’ of both a personal and environmental nature, and will be of interest to all, whether or not a career in healing is the ultimate goal. The ‘Foundation’ course encompasses all aspects of personal energy, meditation and self-healing techniques. It brings an appreciation and understanding of holistic therapies – why and how they work. Students will experience healing – both giving and receiving. Dimensions beyond the physical will be covered – including guides, angels, masters; life beyond the physical and connections to those who have passed to the light. An understanding of the many levels of life beyond our physical and planetary nature is key to our role on the earth at this time and the course aims to give the individual a very real perspective to their own place in the divine plan. 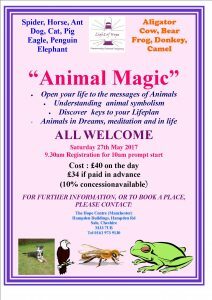 The course involves one full Saturday each month (Foundation Days) and one Monday evening 7pm -8.30pm for ‘Steps’ teachings. Students, as part of their personal development, will be required to attend a minimum of two evening group meditations per month. They may attend as many meditations as they wish. There will be a student card pass ‘Ticket to Light’ which will access all available events to ‘Foundation’ students. Students who do not register for the total ‘Foundation’ course may attend each study day or event separately and individually, and pay accordingly. An Introduction to the Energy FieldThe 4-lower bodies, chakras, meridian and alignment. Step One—Individuality. The eternal journey of the soul through many lives and the quest for self-realisation. 2 MeditationRelaxation, alignment, visualisation. Step Two—PolarityThe role of the divine masculine and the divine feminine in personal and planetary healing. 4 Auric HousekeepingManaging our own energy. Thought, word & deed. The manifestation of disease. Step Four—FoundationMatrix patterns of the soul and the 4-lower bodies of mankind, the human energy field. 5 Living in HarmonyEnergy in your own environment. Household appliances. Creating positive energy at home/workplace. Tools of light. Car as a teacher. Step Five—Co-operationRight action, right intention = flow. Precipitating abundance in work and relationship. 6 Meet the Feet — Introduction Holistic ReflexologyHistory, benefits and contraindications. Human energy field correlation. Feet talking. Practical experience. Step Six—CyclesLaw of Karma: Cause and Effect. Personal and planetary cycles of return. 7 Healing ToolsBach Flower Remedies. Gem Remedies. Sunflower Apothecary—use of creams and oils. Step Seven—DimensionsRealms and spheres. Spiritual hierarchy, Angels, Guides and Masters. 8 The Power of Crystals — An introductionWhat is a crystal. Crystal energy/ properties. Care/respect and cleansing. Benefits and contraindications. Practical uses. Step Eight—HarmonyBalance and flow. Respect for life. Life streams and consciousness. 9 Introduction to Soul RecallHistorical perspective. Memory as root cause of disease.Practical demonstration. Case histories. Step Nine—CompletionDynamic flow. Integrating past experience with present awareness. 10 Colour & Sound experiential dayToning. Healing through sound vibration. Music – positiveand negative effects. Colour healing and visualisation. Step Ten—ConstancyDiscipline of spiritual practice. Non-reaction. Non-attachment. 11 Life PlanStructure of our being. Construction of a life plan. Discovering our pathway. Step Eleven—GatewaysChallenge and opportunity.Free will and destiny. 12 Cycles of LivesWhat happens when we die. Metaphysics of disease.Problems, tests and opportunities. The way ahead. Step Twelve—MasteryEase and grace. Maximum achievement -with minimum effort. 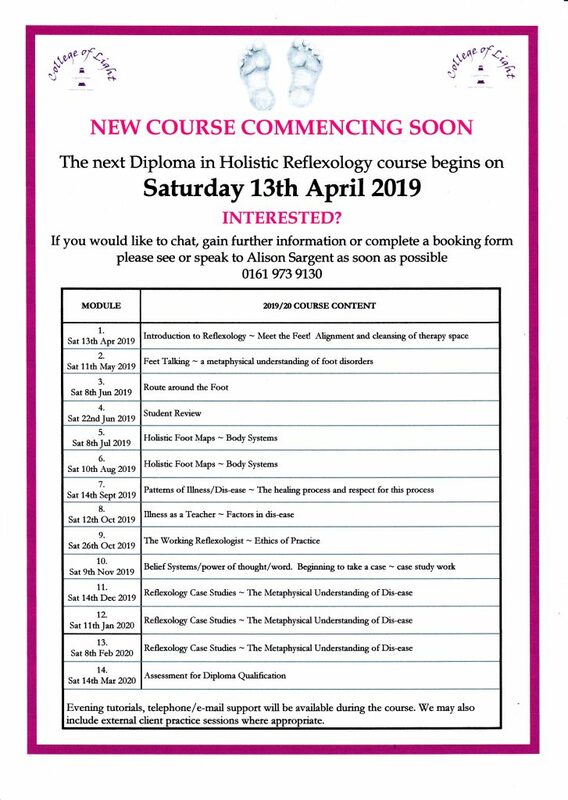 NEW COURSE COMMENCING SOON The next Diploma in Holistic Reflexology course begins on Saturday 13th April 2019 INTERESTED? We are delighted to again be taking part in this wonderful fundraising campaign which, since 2012, has raised over £7 million for local charities and community groups. The Hope Centre Manchester is run entirely by volunteers who give their time in the running of the Centre and support of its many events. All funds we raise through donations will enable us to continue to support local projects, such as young offenders, carers and local families for whom previous funding is no longer available. Last year we raised nearly £1000 which has made a huge contribution in supporting our work with these local groups. How do you make a donation to the Hope Centre? If you can support the work of the Hope Centre in the local community, please visit our Grow Your Tenner webpage at www.localgiving.org/lightofhope between the 11th December and the 10th January to make your donation. You can either make a one off donation by clicking ‘Donate Now’ on the page or you also have the option to make a regular monthly donation over a 12-month period by clicking ‘Give Monthly’. donators who set up a monthly donation for a year. We are extremely grateful for all donations, both one-off and monthly in support of our work. Please share with friends and family and many thanks in advance for any support you can offer. All welcome to begin the festive season with Meditation through Relaxation. Doors open at 2.30pm for a 2.45pm start on Christmas Eve , 24th December. Take some time out from the frenetic energy of Christmas shopping, office parties and catering panic to enjoy half an hour peace and relaxation. Join us for some festive refreshments after the meditation. £3.50 donation. We will focus to Peace with energy enhanced by a crystal configuration. Suitable for those who have mediated with us before. Doors open at 7pm for 7.30 start. £3.50 Donation. We are delighted to be part of this wonderful campaign that literally doubles donations made via the LocalGiving “Grow Your Tenner” programme. 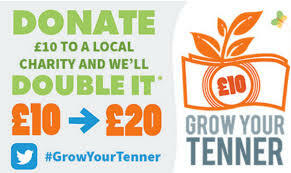 Since 2012 the “Grow Your Tenner” campaign has raised over £6 million for local charities and community groups and in 2016 Grow Your Tenner raised over £1 million for more than 1,300 LocalGiving members. As you may be aware, the Hope Centre Manchester is run entirely by volunteers who give their time and support of its many of its events. All funds we raise will enable us to continue to support local projects, such as young offenders, carers and local families for whom previous funding is no longer available. If you can support the work of the Hope Centre in the local community, please visit our Grow Your Tenner webpage at: https://localgiving.org/charity/lightofhope/ and make your donation. The event opens on 17th October at 10am and runs until 16th November or until the funding runs out – we would really appreciate your support for our work. Names and Numbers Workshop on Saturday 30th September at the Hope Centre in Sale. This is a popular workshop which will give you the tools to begin a journey of discovery, where you will be able to analyse your own names and numbers along with those of your friends, family, and colleagues. Understanding the significance of your name and date of birth. This is a fun and informative day – full notes are provided to provide a reference for future exploration. The day begins at 10am (please arrive by 9.45am) and we will finish at 4.30pm. Refreshments provided in the morning and afternoon – you need to provide your own lunch. Booking is essential – the cost is £40 on the day or £34 if paid in advance (10% concession). Bank details attached if you wish to pay by BACs. other wise we can take cash or cheque (payable to Light of Hope cic}. We will be meditating with a focus of peace, enhanced by a crystal configuration on FRIDAY 22nd September at 7.30pm (doors open at 7pm). Donation £3.50. The meditation is suitable for those who have meditated before (the energy will be high and may be a little bit too powerful for some complete beginners). There is no need to formally book. However, it is very helpful if you let us know if you plan to attend as this helps with planning. 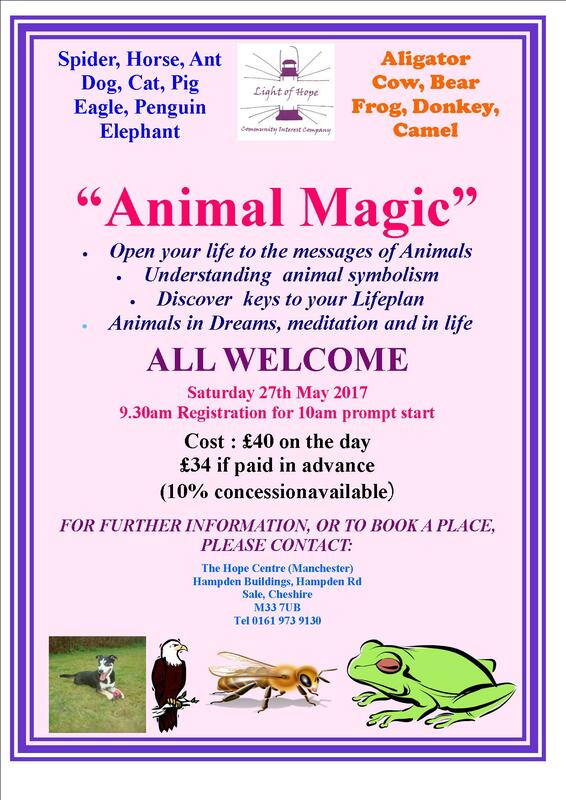 Venue: The Hope Centre, Hampden Rd, Sale M33 7UB. Massage is sharing touch used to heal and soothe the body, mind and spirit. It has been so for many thousands of years, and is something we do naturally with loved ones when we ‘rub it better’. The Touch of Light Massage Course is about developing and expanding not only your knowledge of massage techniques but also to bring greater understanding of yourself and your client’s needs in order that you may give as you would wish to receive. Massage aims to bring calm, peace, harmony, alignment, flexibility, flow and strength. The graduate of this diploma will have the opportunity to work in one of our healing clinics to obtain clinical practice, where their professionalism and competency as a therapist may be developed in a well established and busy clinic environment. Students are supported in their individual and natural development as a therapist. Diploma in Holistic Massage validated by IPTI.